KAPIT: Bridges will be built at three sites in Bukit Goram to improve road transportation in the area. 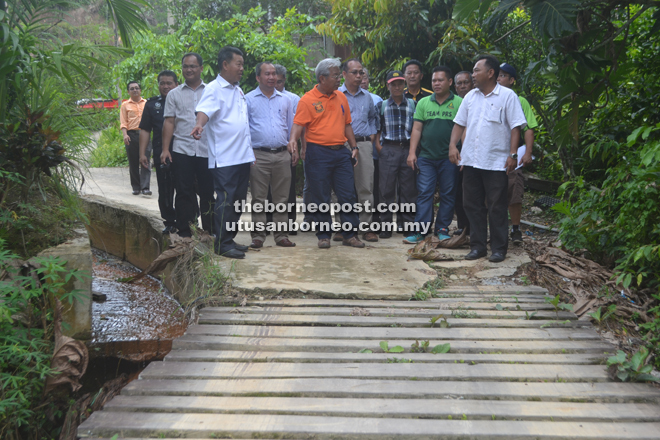 Deputy Chief Minister Tan Sri Datuk Amar Dr James Jemut Masing visited the sites yesterday starting with SK Sungai Kapit, where at present there is only a wooden suspension bridge. “Things have changed. Last time people walked on foot but now things have changed, people use cars. So the bigger bridge has to be built to connect the school to the main road. This is a small amount and we can do that. We’re going to build a Bailey bridge,” he explained, adding infrastructure must also change with the changing of time. He also visited Sungai Sebilat at Jalan Bukit Goram and Sungai Amang at Jalan Selirik, where two small iron bridges will be constructed. “The cost is not much and we can do. Sungai Sebilat Bridge will connect the houses from the other side, while the third bridge at Sungai Amang will connect the other side of the river to open up land. Land owners can develop their land,” Masing said. Meanwhile, Masing also called on elected representatives, heads of government departments and community leaders to work closely with him. “It’s my hope that elected representatives of the respective areas would please be alert to these kinds of problem. Do not wait and until somebody complains. YBs must think ahead, plan ahead, they must not wait till complaints surface. “The only way possible to find out the needs and issues is you must go around to the ground. Find out what the people want and do not wait till the people tell you what they want. You must predict the needs and do it,” he advised.